Speed to market is one of the major challenges for medical device companies; how can you expedite the process while maintaining quality and compliance? Development of devices takes considerable investment of time and money and if you’re a relatively young company, you might not have the runway available for too many delays. We’ve seen several companies fall over before they’ve really got started for these reasons.We’ve also seen established companies extend far beyond their timelines and overspend on budget. Of course, navigating the complex world of rules and regulations is no easy task either. Failing to comply is a significant reason products are delayed to launch and regulatory compliance absolutely must be given the attention it needs. And for those who ignore regulatory compliance yet still somehow manage to get regulatory clearance, they have created giant problem that will rear its ugly head during a FDA inspection or ISO audit in the future. That leaves the question, how do you strike the right balance? 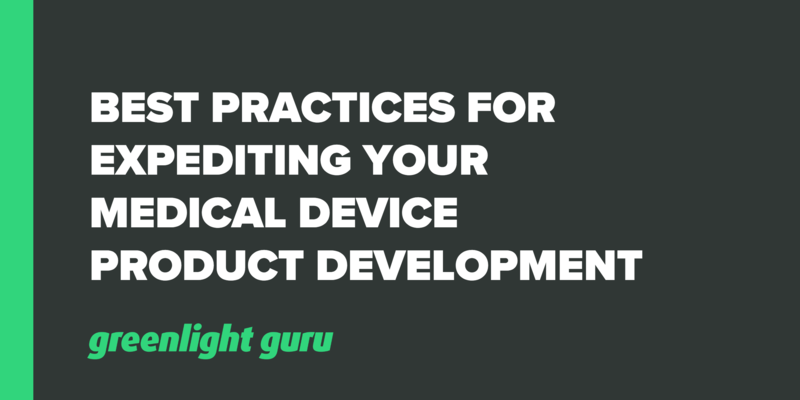 What are some best practices which allow for expediting your product development? Free Bonus Giveaway: Click here to download your free Medical Device Product Development Checklist. Failure to establish a clear need. Does the world really need your medical device idea? Is it sufficiently different to competitors? Submission to FDA is not completed correctly. This is an easy mistake to make, especially if the process is new to you. Failing to consider supply chain during the design phase. You need to know early that there is sufficient supply of the materials you need for production and where to source it from. Requirements for tooling and capital equipment left until late in the design phase. Do you know how long tooling or capital equipment builds required to create your product will take? It’s important to engage prospective manufacturing partners early in the design phase. Most companies aim to get their product to market as quickly as possible. After all, any delay may be an opportunity for a competitor to take your place. If you want to ensure that your product avoids unnecessary hold-ups, here are a few best practices to keep in mind when going into your design and development process. Want to expedite your medical device? Create a plan early. You might feel that the current “medical widgets” are not at a performance standard where they could be, but does the market feel the same way? Iterations and re-iterations of products can cost a lot of time and money, delaying your eventual release to the market. One of the common causes of this is not having a clear vision of the problem the product is actually solving. It is worth spending time conducting a planning phase on defining the problem and ensuring there is a market for the solution you are proposing. To do this, you’re going to need to complete some research. Competitor analysis should be part of this initial research. Look at competing solutions and look for feedback from their users. Are there pain points within the competitor’s product that you can solve with yours? Examples might be; the cost of the product, how simple it is to use, how long a procedure takes or level of comfort with using the product. The next part is determining whether those pain points are sufficient enough motivators for users of competing products to want to change. Will they actually purchase your solution? Market surveys are a good way to determine this, as well as getting beta testers onboard later. One of the biggest causes of delays in getting medical devices to market is missing or disorganized paperwork. A Quality Management System should underpin everything you do within your development process, in fact, it’s required by law (see FDA 21 CFR part 820 Quality System Regulations). It’s up to you how you want to organize your quality system - some companies still use paper-based methods. The issue is that however you choose to manage it, your documentation must be kept up-to-date and you must be able to demonstrate that you have processes and procedures in place that line up with the regulations. The simplest way to do this is through an electronic QMS, which allows you to keep all data easily centralized. We recommend choosing a system that makes it easy to track version control and to keep all relevant parties in the loop at all times. This is one reason why we created the Greenlight Guru solution. During your design phase, you will usually be figuring out what materials you need and what type of manufacturing equipment will be needed. Many developers find that it’s not just a simple matter of getting on the phone one afternoon to source suppliers for these items. If you leave it too late into the design phase, you can find yourself scrambling to find sufficient supplies and having to have equipment specifically built for you, which might take quite some time to create. You don’t want to be waiting for manufacturing equipment or supplies, so put these on your list as early as possible during the design phase. You have to know how your product will be classified by regulatory bodies. Knowing this will determine the type of regulatory submission(s) required. One of the most common regulatory submissions to get market clearance via FDA is the 510(k). A 510(k) is the premarket submission that many medical device developers must submit to the FDA to prove that their device is safe, effective and has been developed according to the regulations. An incredible 69% of 510(k) submissions are rejected by the FDA the first time, while 75% of those submitting first-time submissions are rejected. This can represent significant delays to getting your product to market. We wrote about how to prepare your 510(k) submission in detail here, and one of our suggestions is to always make a plan for submitting it. This is not just a form you fill out in 10 minutes. To do it correctly, you can easily expect to spend 100 hours plus on doing it correctly. Be organized early to get this done, understand the rules and pitfalls around it and budget your time so that you’re not attempting to rush through. One of the biggest take-aways for medical device developers is that expediting your product to market takes organization. It’s one of those things that developers may hesitate over; for example, setting up your QMS seems like so much extra work when you’d rather be perfecting your product, but it is necessary to get it right from the beginning. We’ve seen enough delays to the premarket process that we’d say you are saving time in the long run by setting up systems and processes, learning about the regulations and sourcing supplies and equipment early.